Was picking up some tools yesterday from a friend, can anyone advise me on the below? With the second Mimo tool the top metal piece freely rotates on the base, but for what reason? Thanks very much in advance! My friend is trying to clear out some stuff and doesn't know where to start. Top one is definitely a Jacot tool, a very expensive one, its possibly meant to have a diamond lapp wheel to polish the pivot a bit like this one. The last one what is the metal they are made from and how big are they? I am wondering if its a bag of anodes for plating. A quick test would be to weigh a number of them and then fill up a measuring jug with water and drop them in. You should be then able to work out their volume by how much water they displace. Nickel weighs 8.908 grams per cubic centimeter. Lead weighs 11.342 gram per cubic centimeter. Also if they are tin and you bend one you will hear a cracking sound as the crystalline structure within the tin cracks, lead won't do this. If you are accurate enough with your weighing and measuring and they are not an alloy of elements you should be able to work out what they are made from. Unfortunately I don't have them here to weight them, but I will check next time I'm back. Thanks! Are there any symbols or marks at all on the Jacot? 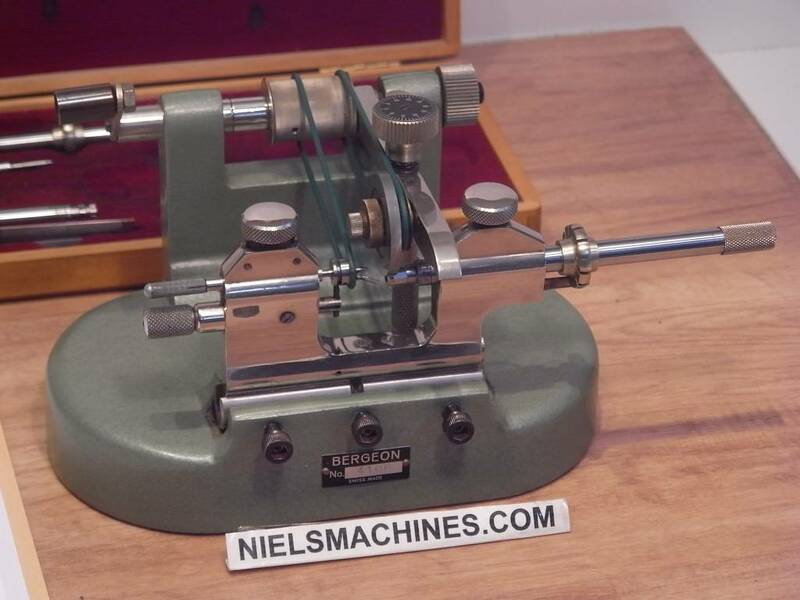 I'm 99% certain it was made to work with the straight burnisher and not a wheel, there were also automatic burnishing machines using straight burnishers quite similarly by Hauser and others. The general look of some of the components says Steiner to me, which would be a rooster symbol if not marked with the name. I didn't get a great look as it, but I didn't see any marks on it. Is the tool driven by turning the black knurled knob on the right hand side? As I understand it when the burnisher is moved front to back it causes the drive wheel to turn which moves the pulley which engages the part. Drive wedges? what's the application? Thanks! The general look of some of the components says Steiner to me, which would be a rooster symbol if not marked with the name. I think you are right, will look up my catalog later. Do you have an old catalog? I have one from the 50s-ish (I think), which doesn't show anything similar to this, but it's old enough that the Jacots are still the old traditional style and not Steiner's later distinctive design. It's be nice to see something from in between when mine was printed and now; I'll get mine scanned and post it up somewhere too. The last one looks like old nails, tho these are bran new, you might find some if you take off a back of a longcase clock or any very old antique furniture, and as Vinn3 said also used on timber floors. Fair play! Thanks very much! m. was faster, but attached come the pictures of my catalog. M.T.M. is not exactly the same but a variant of JB's tool. The tool in the second photo looks like a set of dies and a holding base. It would be used in conjunction with a press for pressing in watch crystals and backs. The tool in the third photo is a small general use drill press. It is good for drilling applications that do not require a high rate of speed. Extremely tiny drill bits will break if turned too slow. I have a Dumore high speed drill press that turns at around 20,000 rpm and is suitable only for extremely small diameter drill bits. Thanks very much for the updates Praezis and David! Unfortunately these aren't my tools, but helping someone identify them so they can move them on to a good home. You should suggest that your friend moves the tools to your home. I did pick up these beauties, half the worlds supply of bows and crowns, pallet alignment tool, some new books and an escapement model I now have as the center of a shrine in the house.